Do you love spicy foods but don’t want singed taste buds? 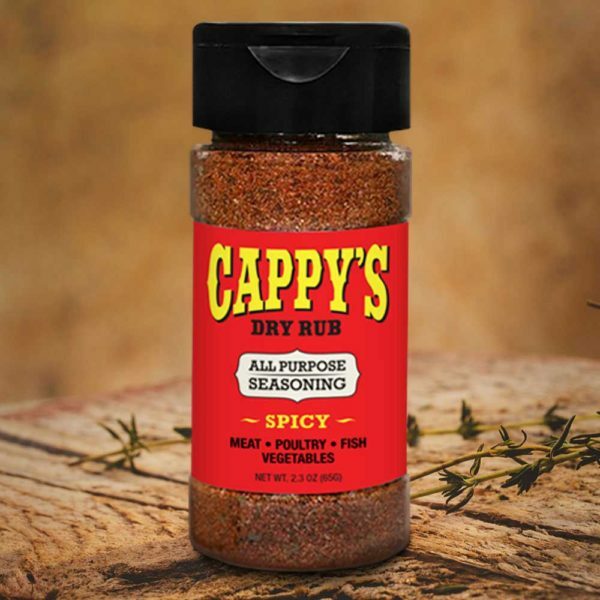 Cappy’s ‘Spicy’ is the spice blend for you. Our ‘Spicy’ is amazingly delicious and also has a nice little “kick” that has a delayed effect at the back of your palate. Do you love spicy foods but don’t want singed taste buds? Cappy’s ‘Spicy’ is the seasoning blend for you. There is a huge difference between a spicy seasoning that enhances the flavor of your food and a spice that’s hot for the sake of being hot. Our ‘Spicy’ variety is amazingly delicious on all meats, poultry and seafood. It also has a nice little “kick” that has a delayed effect at the back of your palate. It’s like a pleasant glow that lingers with you long after you take your first bite. Because Cappy’s Spicy is truly all purpose, it’s wonderful on all types of foods. Try Cappy’s Spicy on your scrambled eggs and wake up your breakfast. Sea Salt, Paprika, Garlic Powder, Onion Powder, Basil, Herbs and Spices.